"I produced the entire application myself as it was an internal project. I had 80% of the application complete in two weeks and spent the remaining time performing customizations using both Iron Speed Designer and Visual Studio." The Fabsec Advisory Service application is a brand new application that was developed to replace an existing company system that consisted of a mixture of paper diaries, Microsoft Excel spreadsheets, Microsoft Access databases and Microsoft Word document reports. The application provides a central storage and retrieval point for all information pertaining to Fabsec clients and their projects as well as logging all activities by the advisory service at a customer level. 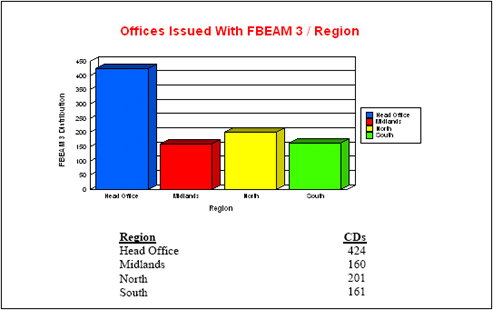 Fabsec's customer base is the structural engineering market, and the advisory engineers use the application to store information about each individual consultancy's office, the contacts that work in the particular office, building projects that Fabsec are working on for the consultancy and additional activities such as whether we have sent them brochures, software or given them a seminar regarding use of our products. 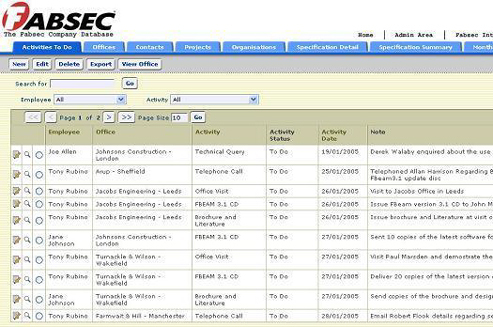 In addition for each project, the advisory engineers are able to connect contacts in the office to the projects and store a work log for any designs or work carried out on the project. Previously at the end of each month, the advisory service would manually collate all activity and project information into detailed reports. With the new Fabsec Advisory Service application, the reports required are just a click away. An integration with Crystal Reports creates the professional teams' reports instantly in PDF format. 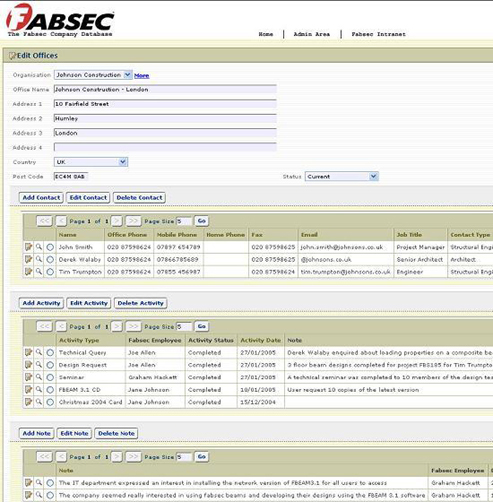 The application also has an activity management system that allows tasks to be assigned to Fabsec employees and email reminders to be sent out. The application uses one database that includes 19 tables and 21 views. There are approximately 10,000 records in all of the tables with the Contacts table being the largest with 2,000 rows. There are approximately 20 web pages in the application including all the Add, Edit and Show Record pages. I finished and deployed my application in a little over four weeks. The app was demonstrated to the company's professional team, and because of its strengths, some additional customer projects may be completed on it. I produced the entire application myself as it was an internal project, and the rest of the team was needed to continue on our main job of producing software to support our range of cellular beams. I had 80% of the application complete in two weeks and spent the remaining time performing customizations using both Iron Speed Designer and Visual Studio. ASP.NET stores state in the view state, and I ended up with large HTML pages which appeared to slow the performance of my application. Obviously, view state is an issue with .NET and not with Iron Speed Designer. I fixed the view state problem myself by modifying the Iron Speed base classes. I also added report generation with Crystal Reports, and added automatic email functionality to the activity management section using Iron Speed Designer's email library. I kept the standard Everest theme generated by Iron Speed Designer as this was perfect for my application; the only change was that I added the company logo and an extra set of navigation links to the header area. The main metric was the performance of the application over the VPN by the advisory engineers and if the all the advisory engineers could use the system simultaneously. Regarding this metric, the application was a success. Basically because of what I have been able to achieve with Iron Speed Designer, I have been able to revolutionize the way our advisory engineers have been working. Previously they all had individual spreadsheets, paper diaries and simple flat file access databases that were all on their local machines. At the end of each month, they were producing directors' reports manually by going through all the previously mentioned material. This not only meant that each advisory engineer could not see each others' contacts, but also meant we in the head office could not add new target customers to their databases. The current application now includes task and activity management with email notification and will automatically generate all of the monthly reports as PDFs. Previously, the report task took them over a day to produce due to having to back track through old records. Now it takes under 10 seconds! Writing asp.net and web applications is not an activity that would normally be undertaken by the team I work in because we mostly write Windows form applications in VB and C#. But the problems with sharing the data between the advisory engineers and allowing them to use the system when offsite became such a need that I was tasked with producing a solution. I wanted to sort the issue out with a minimum of effort and looked at various ways of achieving this. One solution was to create a Microsoft SQL Server database and use Microsoft Access to retrieve and edit the data. Another was writing a Windows form application that the connected over the VPN to the Microsoft SQL Server database. It was purely by chance that I spotted a small paragraph at the top of a newsletter mentioning Iron Speed Designer. I downloaded the demo and had a pretty good application in about 30 minutes. This would have been an acceptable solution but due to the ease of customization I have added a number of extra features. To sum it all, Iron Speed Designer is fantastic. It is the first app I have bought where the application has exceeded my expectations, the support has been excellent and with a fast turnaround, and for once the maintenance purchase is going to be worthwhile. Nick Craven-Smith is a Software Developer for FABSEC in Leeds, United Kingdom. He has been developing applications using Iron Speed Designer since 2004.